Helianthous, Vipin, Nitish, Utkarsh, Princy, Akshita, Nirjara, Himani, Chandni, Shekhar and Monika, research scholars at Rup Lal’s laboratory, University of Delhi equally contributed to this article. 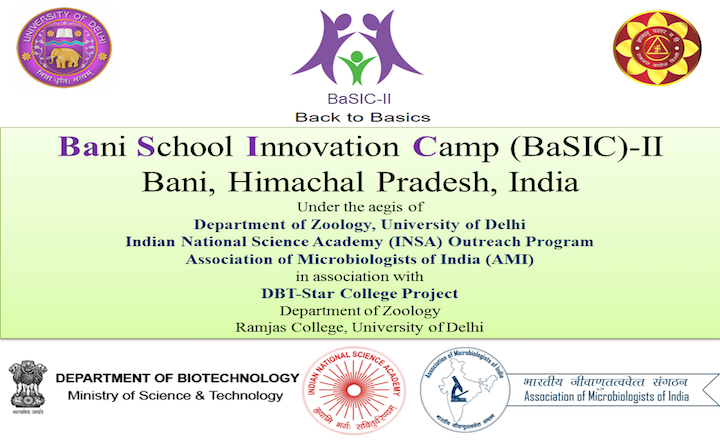 University of Delhi and Ramjas College, along with Indian National Science Academy (INSA) and the Association of Microbiologists of India (AMI) came together for an innovation camp termed BaSIC II (Bani School Innovation Camp II) from 6th to 8th March, 2018 at the Government Senior Secondary School (GSSS), Bani in the Hamirpur district of Himachal Pradesh. The first BaSIC camp was held in December 2016 and was conceptualized by Rup Lal (Professor, Department of Zoology, University of Delhi), a globally renowned scientist and the 1969 alumnus of GSSS. This year the camp was organized with an aim of including rural areas through the cultivation of scientific thoughts in young minds, promotion of student-teacher interactions, and the development of students’ communication skills. The central theme of BaSIC II was “The World as You See”. The sessions and modules were designed to interest school students in the field of science, technology and mathematics (STEM). GSSS Bani was established as a primary school in 1905. In 1951, it was upgraded to a High School, and subsequently in 1990, it became a Senior Secondary School (co-educational), educating students from the villages located in and around Bani. Over the years many students who passed out from this school have done very well for themselves. The camp started with welcome address by the GSSS school principal, Mr. Sudershan Kumar. Rup Lal, in his talk emphasised on the need of more such programs to tap the potential of the country’s young minds. The talk was followed by an interactive session with the students of classes VI-VIII. The interaction was centred around their career aspirations; the responses were interesting, and varied- army men, doctor, chef, national kabaddi player. The STEM sessions included the working principle of a periscope, staining of cheek cells, and chromatographic separation of chlorophyll pigments. The idea was to excite them about science and the fun of doing it. The sessions were very successful as gauged by the students’ excitement and involvement. An interactive session for teachers entitled “emerging trends in teaching methodology” was conducted by Charu Dogra Rawat (Departmental Coordinator, DBT-Star College Project, Ramjas College) and Rup Lal. The session involved teachers sharing their teaching techniques; mostly it constituted of stating the topic from the syllabus - the “chalk and talk” method. The session introduced them to inquiry-based/research-based learning in which a role reversal is envisaged, and students own the responsibility of their learning. Topics are introduced by giving real-world examples: students with the help of teachers devise a problem, perform activities and analyse the output. The session ended with a discussion on the challenges in adopting such a strategy in a rural scenario. The consensus was to start small i.e. teaching one topic at a time in an inquiry-based manner. A session on “Major Discoveries in Science and their Impact on Daily Life” was also conducted. Rup Lal talked about the journey of a few renowned personalities (APJ Abul Kalam, Sachin Tendulkar, Bill Gates, Steve Jobs) and the challenges they overcame to achieve pinnacles of success in their respective fields. The session was followed by talks on “Career Opportunities for Young Students” by Pratyoosh Shukla (General Secretary, AMI), Yogendra Singh, Mallikarjun N. Shakarad (both from Department of Zoology, University of Delhi) and Sukanya Lal (Project Coordinator, DBT-Star College Project, Ramjas College). As a reward of excellent academic record and for motivation, students participants (of classes VI-VIII) were then presented with certificates and mementoes. The principal and school teachers were also felicitated. BaSIC II was an attempt of its kind to include rural areas by inspiring and motivating the younger generation and sensitizing the teachers. Research scholars and undergraduate students too gathered memorable experiences; Samikshya Samantaray, a student of Zoology at Ramjas College states – “We had the opportunity to take responsibilities, collate the material and deliver the whole lecture in a simplified format which is not only free of distortions but also understandable”. The camp ended with a high-energy kabaddi match with the students of GSSS.